I love this tent, it feels safe, warm in cool weather, cool in hot weather and has plenty of room, you could stay in it for a long holiday. The only downsides are the packsize and weight. The layout is excellent - large family living area big enough to take several chairs and a good sized table and there is a push out kitchen area which is very useful. 2 bedrooms, although 6 berth we found it ideal for 3-4 with plenty of space. Really thick, quality groundsheet in the sleeping pods and the roof lining not only finished it off nicely but provided excellent insulation. Because it is cotton canvas, there was virtually no condensation in the mornings unlike a lot of polyester tents. It was cool in the heat of the day but very snug when the temperature fell at night. We had a torrential storm with lashing rain and gale force winds - the tent never budged and stood firm throughout taking everything the British weather threw at it! The only reason I have given it a score of 9 is the pack size and weight - it is very large and heavy - as long as you have a suitable vehicle and storage then this will not be an issue but I feel it needs pointing out. 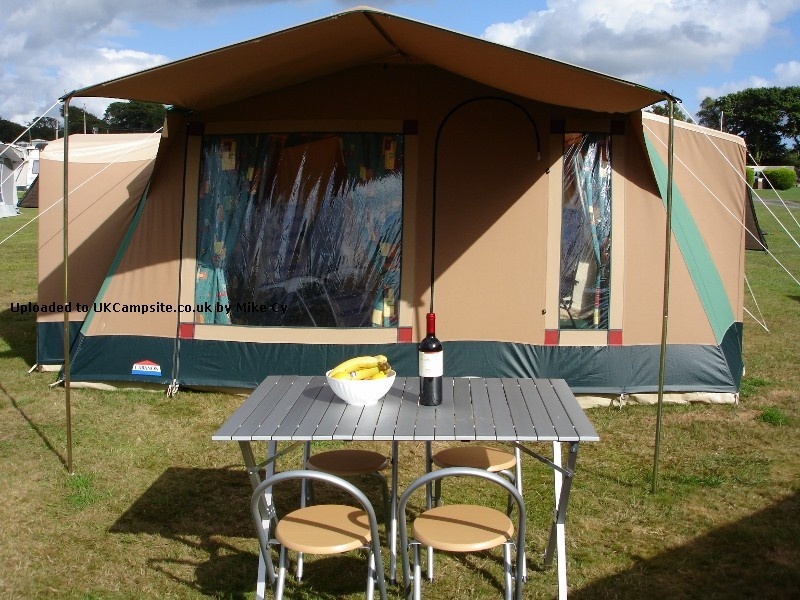 I also feel that, although the quality is superb, it is not quite as good as Cabanon tents were a few years ago - comparing it with my old Montpellier, there seems to have been some cutting of corners in quality generally. But all in all, a stunner of a tent. 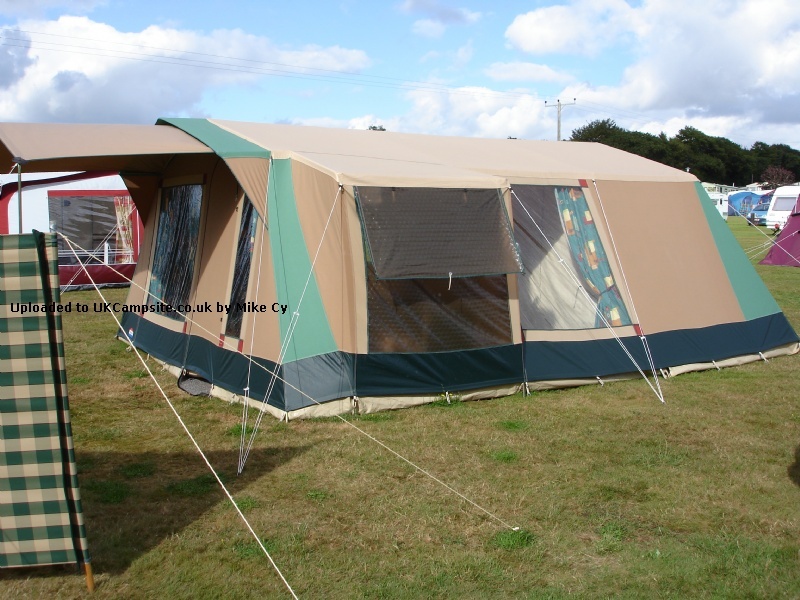 Bought an Aruba with the optional bedroom annexe and sun canopy second hand. Never having been in a frame tent before let along owned one I was a bit apprehensive but the big tunnel tents didn't really do it for us. The Aruba with the separate bedroom just seemed to offer a better layout with three separate bedrooms of which ours was a very good size and sufficient living space without being the size of an aircraft hanger. Pitching was a lot simpler than expected - yes it takes a little bit of time but you can do it single handed without risking snapping poles. Inside it was just the right size. The whole thing seemed very secure, it didn't flap about in the wind and it withstood some wet weather very well. It doesn't have a sewn in groundsheet and maybe in colder weather that might mean drafts get in but as I've never had a tent with a sewn in groundsheet I can't really compare it. The real disadvantage is pack size and weight. It is pretty hefty - though we managed to get the lot, us, three kids, a fair sized dog and enough kit for a week's holiday into our Fiat Doblo. Overall glad we got it - with the extra bedroom I reckon it's a better solution than modern tents that pretend 140cm is wide enough for a double adult sleeping space. A very good example of a family tent. Strong, durable, secure and sound. Having bought the wardrobe/utility extension and the sun canopy I couldn't wish for more except perhaps a zip in groundsheet which in my humble opinion together with mozzie windows under roll up acetate windows would make the unit almost perfect, at least for me. Pitching can be a bit of a pain if like me you need everything perfect. It can take me 2� hours and more. I am not the quickest and that is with two of us on the task. Large enough for an average family and when kept tidy has ample space for lounging and eating should you wish to eat in. All in all a good buy as it serves all our needs. We have considered a new Biscaya due to the zipped in groundsheet but are concerned about wardrobes taking up too much floor space due to the curved outer walls and the fragility of the hooped poles. (I have helped to repair fellow campers poles who have damaged them during the erection process). Those concerns together with the cost of a new 500 as against our as new Aruba leaves us with no choice but to keep with the trusty Aruba in spite of the pitch up time. The effort is worth it, a superb bit of kit. We have had a couple of Arubas (the first one didn't wear out, we simply decided to have a change, then missed it so bought another!) and they are great frame tents; the frame is easy to put together (recommend colour-coding the poles, which makes pitching quicker) and the whole thing is a good shape for any pitch. Quality is second to none and, if you position a good groundsheet over the heavy-duty flaps, it makes for a cosy living area. The roof linings take extra time to attach but provide good insulation; making the tent cooler on warm days and warmer on cool ones. We bought our first Aruba second hand, as they often available and so good savings can be made and it is a good way to try out camping in a cotton canvas frame tent without taking a huge financial risk. Frame tents, if well looked after, seem to hold their money well so it is possible to use one for a season to see if it suits your needs, then sell it on without much (if any) loss if it doesn't. The one thing I didn't much like is the kitchen area. I'm sure it suits lots of folk, and I can see how it keeps the cooker etc out of the way, but that area adds to the pitching time (something I am always looking to reduce). 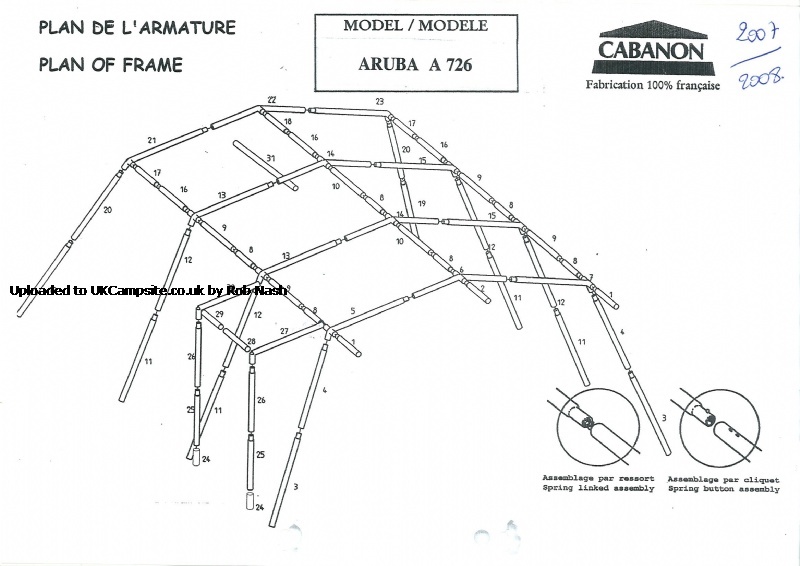 We bought all the extras for our second Aruba; interchangable bedroom and utility annexes, sun canopy etc, then realised that the larger Cabanon Espace would probably a better option for us - just a simple rectangle with no push out kitchen area - and quicker for us to pitch without the add-ons, hence it was ta-ta Aruba! Still, it's a lovely tent. Regarding the post by Gingerlily and the possible change of materials in the last paragraph. I also saw the 2008 brochure and was concerned about the change of material. A quick e mail to cabanon soon confirmed that the brochure is wrong. The tent is still canvas. Bought a 2008 ex display from Forest Camping. With the money I saved bought a high sided trailer to put it in. We have an aruba, purchased off ebay for �250, what a bargain it turns out! Only used 4 times before we got it. It's a fantastic tent, very robust, very spacious, lots of room for the dogs to stretch out as well. Easy enough to put up and down even when it is just the two of us. We wild camp as well as on sites, and a big tent is just so much easier, can have a strip wash with no hassle etc. I love my aruba! We have a Cabanon Nadia which sounds very similar. Ours must be approx 25 years old and still going strong. We needed to cut down the poles as the canvas had shrunk this year but this means a perfect fit and will last another 25. If I was to replace our Nadia it would be with an Aruba. They are so majestic looking. Our previous tent was a royal rimini frame tent that got lost to the summer weather of 2007. For our next family tent I wanted another frame tent, but now seriously in to camping I was prepared to spend a little extra on a top class high quality make. My investigations led me to the Cabanon aruba and needless to say it did not disappoint. The bottom 16 inches is a rubbery textured material to protect from splash back and so is the roof, there is a good 8 inch flap around the tent to fold under the ground sheet and the main body of the tent is a good quality heavy set canvas. The seams appear to be double stiched and excellent strength. The frame tubing is better than any of the other tents I have seen, it looks like 20mm steel galvanised tube and each frame and canvas is made to match so it fits like a glove. Erection is fairly straight forward and can be done one your own but it is miles better done with 2 or more people. The inner tents are made very well with a heavy set rubbery base and good quality light weight body, they hang on elastics and plastic clips which are a good snug fit on the frame. There are two seperate bedroom compartments the large one has a centre curtain which can be left up or down with room to fit 2 double size inflatable matresses, and the smaller inner tent has enough room to fit a double bed size inflatable matress. Between the bedroom compartments is a rail for hanging clothes. The smaller inner tent has a flap which comes across to cover the gap which finishes it off nicely. Finishing touches are a roof liner and curtains which match the colour of the tent beautifully the curtains hang on plastic rails with a series of small plastic hooks which interlock holding the curtains firmly in place, across the bottom of the windows runs a line that holds them in line with the profile of the tent. Optional extras that we have are an extra bedroom compartment which comes off of the left hand side of the tent and the sun canopy, both of these are an absolute must, the canopy gives you the much needed cover over the entrance and is effective in all types of weather, the extra bedroom means that we can use the large inner tent for the adults bedroom and store stuff in it to make room in the main living compartment. There is no ground sheet it comes with pegs and a mallet plus storage bags and packs up in to 2 large bags, beware together the bags weigh in excess of 50kg and would fill a saloon cars boot if it fits at all. To summarise, although expensive it is worth every penny as it is very high quality all the components are made well and because it is a popular brand spares and accesories are easy to come by, this tent should last a lifetime if properly maintained. 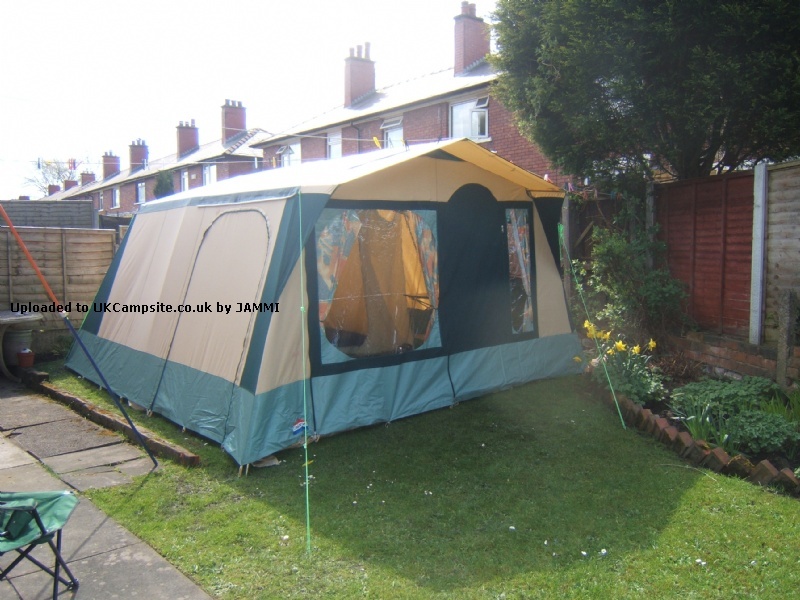 I purchased mine at camping international and bought the canopy, bedroom annexe and annexe inner tent with the tent and various other camping accessories and was given a 10% discount. I would highly recommend this tent and cabanon on the whole as so far my experience has been fantastic. Add your review of the Aruba! 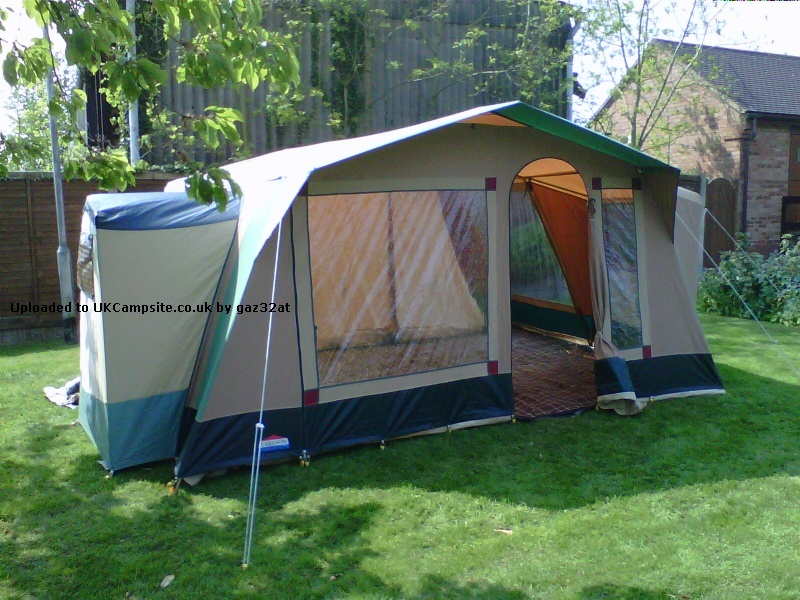 The traditional Cabanon tent shape for great family camping holidays. 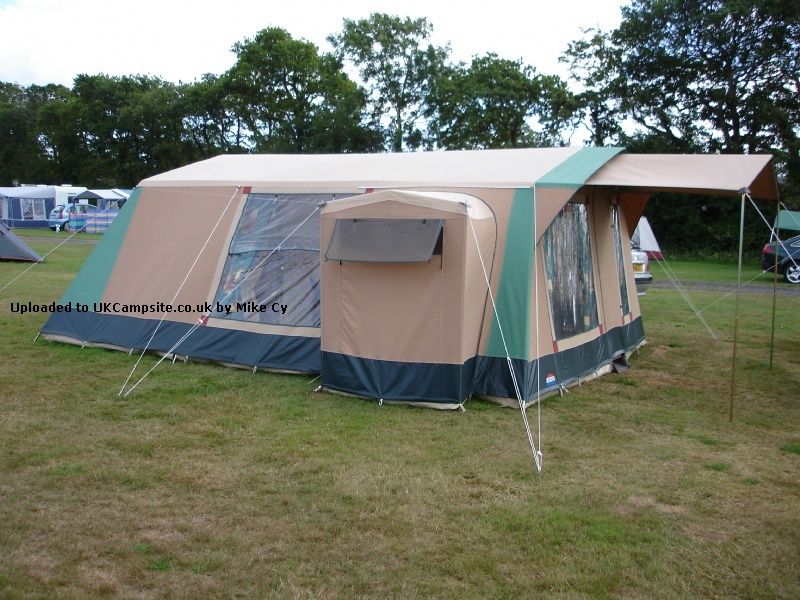 A pleasant tent to stay in with its optimised height, large doorways and various practical details. 3 interior tents offer separate sleeping areas. Kitchen extension with a large mosquito-netted window and exterior blind. 2 large windows in the living area to benefit from available light. Roll-up front for perfect tent ventilation.